You made a wise decision installing Brick Pavers to enhance the appearance of your home. Why not protect that investment with Brick Paver Sealing? We enjoy beautiful sun-drenched weather year-round. But our sub-tropical climate can accelerate the deterioration of your impressive brick pavers causing them to chip, crack, and loosen. Heavy rains also cause the sand joints to erode. Weeds, mold and other fungus can grow between the pavers and the accumulated grime and discoloration can make your driveway, patio and walkways look less than desirable. Our Brick Paver Sealing is an eco-friendly water-based solution that doesn’t use harmful chemicals or acrylics to protect your pavers with our signature “wet-look”. 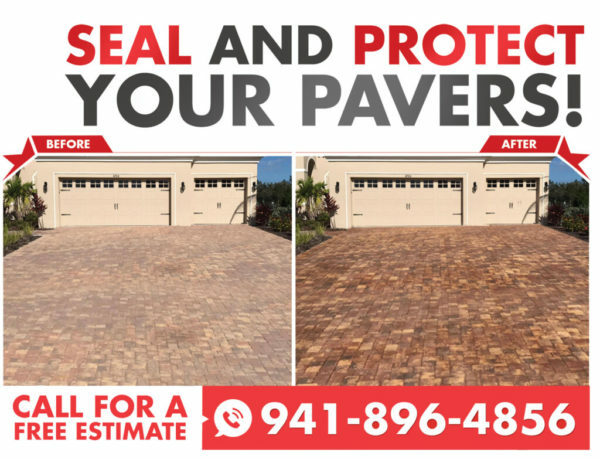 Our trained and certified Brick Paver Sealing professionals serve homeowners in Venice FL! Protects brick paver surface – Paver sealing adds a layer of protection that resists moisture, weeds, mold, dirt, and pests that can damage the surface. Enhances curb appeal – Our custom sealing formula gives your driveway, pathways, patio and other paver surfaces a beautiful long-lasting shine (“wet look”) that enhances curb appeal. Locks in pavers – Our Seal ‘N Lock technology locks-in the sand joints to prevent erosion that can cause pavers to sink, chip, crack and loosen saving costly repairs. Easy clean surface – Our smooth, shiny surface makes cleaning a breeze. Simply wash the brick pavers with water to remove any dirt or spills on the surface. Pet and eco-friendly – We use a custom water-based solution without acrylics that is safe for pets, plants and the environment. Our hot, humid and wet weather can damage the pavers resulting in costly repairs. Bricks are made of porous material that absorbs moisture. Eventually, the pavers weaken, and the sanded joints erode. This can cause cracks, chips and loose pavers. In addition, the humid weather is ripe for the growth of weeds, grass, mildew and fungus. Our water-based (non-acrylic) brick paver sealing waterproofs the pavers protecting it from damage due to moisture. It prevents weeds and grass from growing between the sanded joints and resists mold, mildew, and pests. Sealing your pavers also protects your brick paver investment from fading and discoloration due to the damaging effects of the sun’s UV rays. Your brick pavers will maintain its aesthetically pleasing condition with the vibrancy you desired so your home in Venice FL will always look its best. Our signature “wet-look” that gives your driveway, walkways, patio and other surfaces a glossy finish is one of the most desirable features of Brick Paver Sealing. Your surfaces will look strikingly clean and polished with no extra effort required on your part. It will enhance the curb appeal of your home and protect the paver surface in rain or shine. 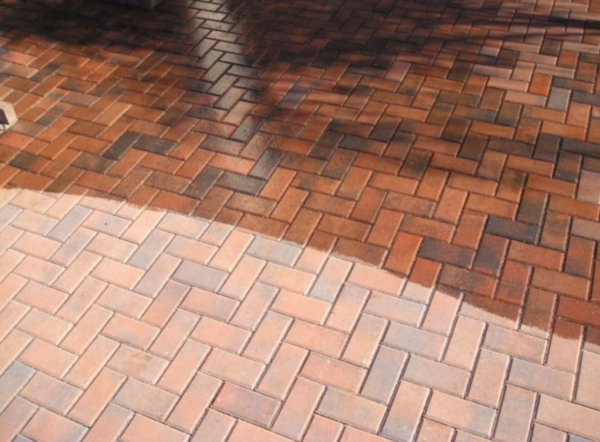 Our Brick Paver Sealing service includes high-pressure cleaning. In fact, it is the first step in our process. 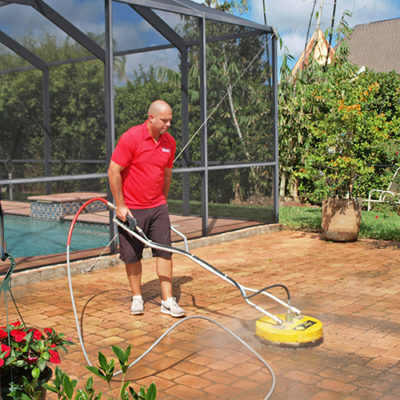 Our specially trained technicians are certified for our Seal ‘N Lock technology and use professional equipment to deep clean the pavers and sanded joints. This important step in the process uses mild detergents and warm water to loosen and remove the built-up dirt and grime deep within the surface. The technician will also remove any weeds and grass between the pavers and fill gaps in the joints with sand. Now that your surface is completely clean, the technician will apply our water-based sealant to lock-in and maintain its beautiful condition. This eco-friendly custom formula contains no acrylics or harmful chemicals and is safe for pets and plants. It dries in just a few hours (not days) leaving an impressive glossy surface that will add to the curb appeal of your home in Venice FL. Our brick paver sealing offers long-lasting performance. With Brick Paver Sealing from Red Hot Services you get durability and performance that will last for up to 3 years. This will protect your pavers from fading, water damage, weed and pest infestation and it withstands extreme weather conditions. Dust, dirt or stains won’t adhere to the surface. Simply rinse your driveway, patios, walkways and other paver surfaces with water to clean. To maintain its maximum strength and performance, we recommend Brick Paver Sealing every 3 years. Red Hot Services provides Brick Paver Sealing solution with Seal ‘N Lock in Manatee and Sarasota Counties including Bradenton, Longboat Key, Siesta Key, Lakewood Ranch, and Ellentown FL.